14 inch slip joint canvas pipe, 1000 feet long, used for irrigating hops, Sumas area. 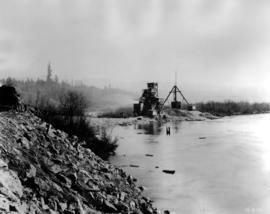 BC Hydro's Ruskin development; crane and aggregate processing plant; photograph no. R.P. 180. Baseball and big syphon at Oliver. Centrifugal pump, movable, capacity about 1200 galls. min. used for irrigating hops, Sumas area. Distribution chamber from No. 2 pump at Oliver. General view, tractor, pump, and 14 inch canvas pipe used for irrigating hops, Sumas area. Irrigation water flowing down ditch from end of 14 inch canvas pipe, used in irrigating hops, Sumas area. Main canal at Oliver near station 90. Old motor-car used for pumping water at Glenmore July 1926. The syphon completed under MacIntyre Creek. 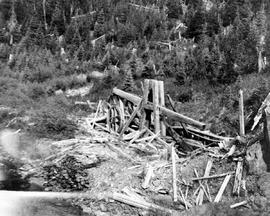 Top view of Hester Creek spillway on the Oliver Project. Tractor used for driving centrifugal pump, hop yard irrigation, Sumas area. Water storage dam located between Hydraulic Camp and Bullion Camp on the road to Likely.